Ireland's ABC "Another Bloody Castle"
Europe is the birthplace of the castle and the home of the vast majority of the castles in the world. Having traveled to Europe on various occasions, I thought I have seen enough castles. On a recent trip to Ireland, I took part in a tour to the outskirts of Dublin and towns famous for their castles like Kilkenny and Killarney. And many castle ruins came into view as we traveled to the countryside. So, it’s not uncommon to hear the phrase, “ABC - Another Bloody Castle” even from the tourism industry folks. I could not help but notice how the castles in Ireland differed from what I saw in Germany and France. The castles I saw in Ireland were more like castle ruins, damaged by war and had been restored for tourism. I don’t want to minimize the castles historical and cultural significance, but I look more into the aesthetic point of view, such as the architecture from the medieval, stone and elaborate designs like the Neuschwanstein Castle in Germany that inspired Disneyland or the magical castles that inspired many fairy tales. However, I think two castles in Ireland are worth a visit: the Blarney Castle that provides a stunning backdrop to a landscape that is representative of the country – Ireland’s Forty Shades of Green, and the Ross Castle in the middle of Killarney National Park that provides a stunning backdrop to beautiful scenery. The Blarney Castle is situated eight miles of County York. It’s a medieval stone castle that dates back from the 12th century and was restored in the 14th century. Today, it looks warlike from some sides and looks magical from the front side as it provides a stunning backdrop to a beautiful landscape. One of the most delightful thing for me was walking through the castle ground amid the serene and magical gardens. Although Blarney Castle is one of the most visited castles in Ireland, I felt I was the only one visiting as I walked through the gardens. I was greeted by a field of greens with a tiny red tree in the middle. I crossed a tiny bridge and walked along the waterways and yard dotted with trees in fall vibrant colors. I took pictures of the exotic plants (large ferns) along the canal before walking my way up to the formal castle gardens. I was intrigued by the diverse surroundings that include the Poison Garden (toxic plants, including marijuana) and the Rock Close magical garden. But in the end, I simply marveled at the garden designed by Mother Nature (picture below). There’s nothing much to see inside the castle except to climb the claustrophobic stairs to kiss the Blarney Stone, which is set in the wall below the battlement. Legend has it that Jacob’s Pillow brought to Ireland by the prophet Jeremiah, became the “Lia Fail” or Fatal Stone used as an oracular throne of Irish kings. According to the literature from the Barney Castle tourist info, this legend has been kept alive for 200 years. 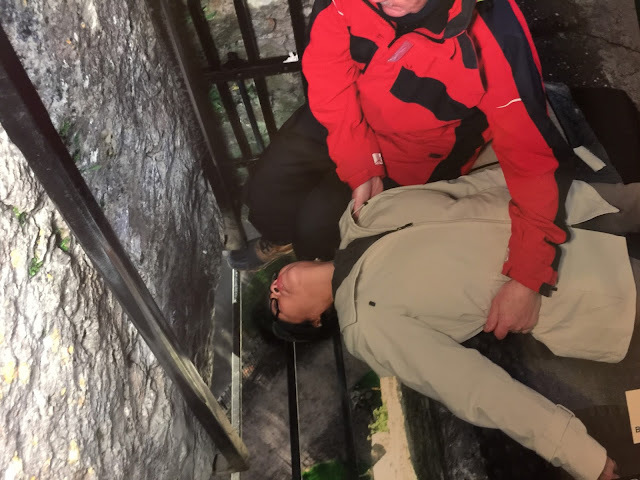 Millions of pilgrims, including statesmen, literary giants, and movie actors have kissed the Blarney Stone for the gift of eloquence. For what it's worth, I joined the few visitors to the parapet walk to kiss the Blarney Stone. With the aid of an assistant, I leaned backward and hold on to an iron railing to kiss the stone. The immediate effect for me after kissing the stone was the appearance of a rainbow. I hope I still get the gift of gab. And speaking of the rainbow sighting, from the top of the Castle I relished in the amazing view of sprawling parkland, gardens, avenues, arboretums, rivers and the Blarney Mansion. The Ross Castle is idyllically set in the heart of Killarney National Park. It sits on the edge of Lough Leane, looking out on to the lake and Inisfallen Island. The castle itself looks warlike, but it provides a beautiful backdrop to the stunning scenery that the whole effect is magical. Here’s a short video of the castle and the scenery surrounding the castle. Click on the thumbnail below.